I had a few hours to myself (no babies or boyfriend) so I decided to visit a few drugstores to browse around. I wasn’t really looking for anything in particular, but I found myself in the makeup section every time (oops) and ended up finding a few amazing deals! This took place last Friday, so some places had already gotten rid of all their Halloween clearance, but some still had a little bit here and there. However, I also noticed that many of the spring and summer makeup lines were being clearanced as well! My heart skips beats when I see clearance lipstick. Is it possible to be head over heels in love with lipstick? I think I am, and it’s a problem. I can walk past almost everything in a clearance section without issues, but the moment I see clearance lipstick it somehow magically ends up in my basket. I can’t be the only one. Any fellow lip product junkies? Anyway, I noticed at a local Walgreens that they had the Milani lip intense liquid colors on clearance for 50% off, so I snagged a few more since I only have the red color (and love it). What I like about these is that they go on smoothly and aren’t glosses, but not quite lipsticks either. The pigmentation on these are incredibly intense as well. They are not very long lasting though. At that same Walgreens I also found a Milani Lipstick in the shade “Chilled Brandy” that looked pretty and like something I don’t already have in my collection (rare) and it was only $2. 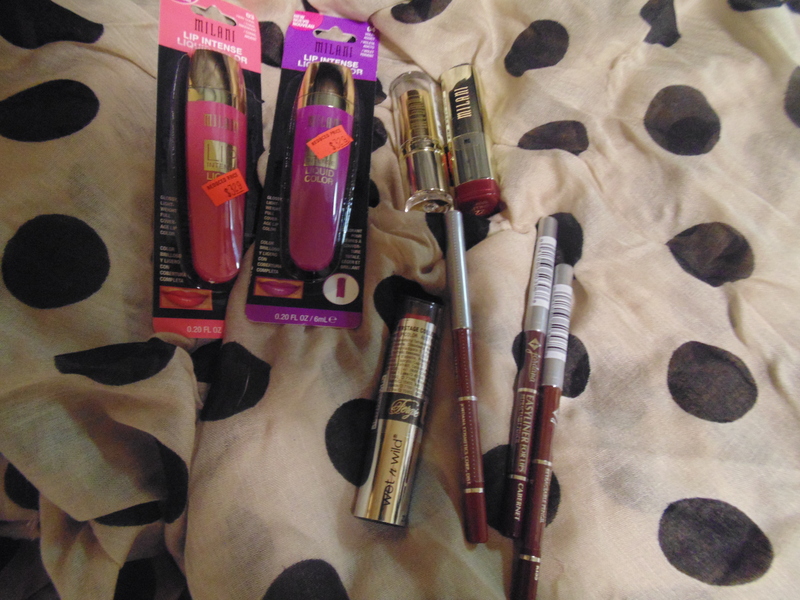 I picked up a Wet n Wild lipstick from the Fergie line in “Old School Glam” for $1.19 and 3 Jordana lip pencils at 50 cents each! I’ve been wanting to try Jordana lip pencils for a bit now, and I am suddenly on a lip pencil kick? 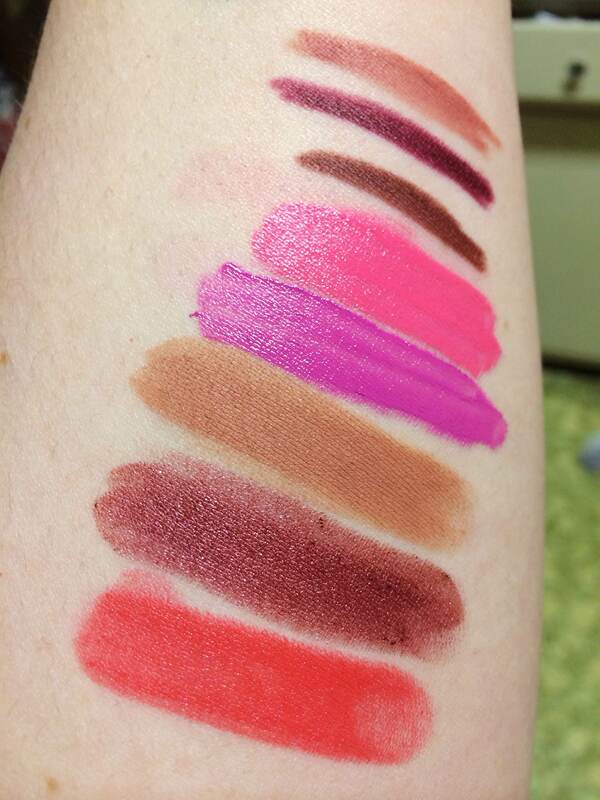 I now own probably 20 different lip pencils and I have never been too into them. Youtube made me do it. Yeah, we’ll go with that. The one thing I didn’t get at Walgreens and that wasn’t on clearance was the Milani lipstick in Enchanted Topaz. I just wanted this color because it’s limited edition, and the swatches I have seen of this color are beautiful! I will say that my first impression of the Jordana lip pencils are that they are very creamy and seem like they will be easy to work with. The Old School Glam lipstick is a bit too creamy and sheer for my liking when it comes to red lipsticks, but I may be able to pair it with a red pencil and make it work. I didn’t just find lipstick though. I found some cute little things to go on my desk for 90% off and candy marked down at 75% off. I decided to be spontaneous and try caramel apple Twizzlers despite how the thought kinda weirded me out, but strangely I love them. I kind of regret only getting one bag of them to be honest.